Marrakech...More and more travelers are seduced by the atmosphere and cultural wealth that make the city a success. In a colourful and mysterious landscape, the warm welcome of the locals only accentuates the general feeling of well-being procured by such a destination. As proof, the inhabitants are nicknamed bahja meaning "happy people". Only a few hours by plane from Europe, Marrakech nevertheless promises an undeniable change of scenery: souks with oriental smells and colours, the enchantment of the Djemaa el-Fna square, hammams and traditional riads built around a patio, the medina UNESCO World Heritage site...So many elements come together for exceptional moments. For the change of scenery to be total and exclusive, Villanovo offers its customers, in exceptional settings, a personalised selection of sublime villas and traditional riads. 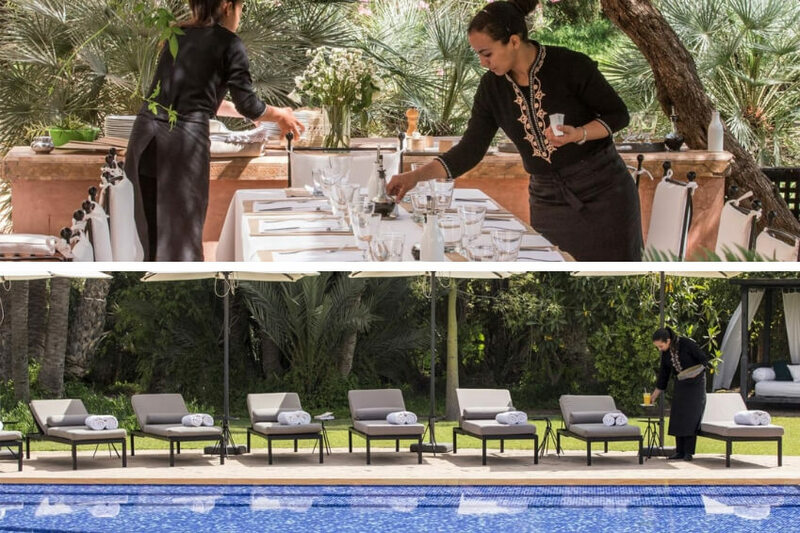 If these exceptional accommodations enjoy a 5-star environment, they are also accompanied by a bespoke service for an exclusive experience from A to Z...Discover the luxury pack in Marrakech, composed by Villanovo, just for you. Over time, Villanovo has become one of the most exclusive selection of villas and riads in Marrakech. Imagine, more than a hundred luxury properties scattered between the Palm Grove, the Ourika Road, Al Maaden, or near the golf courses of Amelkis or Royal Palm. All of them have been renovated, equipped and decorated with the utmost care. Talented architects are at the origin of these havens of Moroccan peace, who provide the greatest change of scenery. You are guaranteed, there are real architectural gems away from the excitement of the city. You can revitalise in a refined, elegant and intimate environment with your loved ones. Immerse yourself in traditional architectures and decorations, mixing authenticity and modernity. Like the palaces of yesteryear, the interiors of the villas are embellished with ceramic lamps, large mirrors and unique pieces collected by the owners during their travels in the Arab world. Indispensable to a Moroccan property, you will find patios, cool havens in which the light penetrates naturally, offering a feeling of intimacy. This is without talking about the terraces overlooking Marrakech: on the roof, in front of a room or on the ground floor, one thing is sure, your terrace will enjoy an exceptional view. Facing the grandiose Atlas Mountains, or immersed in a huge private garden, these solariums allow you to appreciate extraordinary views conducive to relaxation. And if you cherish moments of relaxation, you will not be disappointed! Equipped with hammams and saunas, our villas in Marrakech offer moments that plunge into another world, which allow you to escape to new horizons. These traditional baths are ideal for loosening up and relaxing under ancient rites. They are perfect to heal your muscular tension during long days of excursions in the red city. It's time to be pampered, and think about yourself, accompanied by a glass of champagne or a traditional mint tea. What a way to live, in true luxury! Continue these moments of well-being by basking in one of the jacuzzis sheltered by some of the houses. If you are looking for an outdoor holiday, our villas and luxury riads in Marrakech will meet your criteria. With magnificent gardens, shaded by lush trees scattered on a perfectly maintained green lawn, you can enjoy the climate of Marrakech. Also, to cool off, our villas are equipped with private pools, allowing you to enjoy a family moment away from the heat and tourist nuisance of the big city. Installed on the roof, indoor, heated, overflowing or in the middle of a patio, you will find the pool of your dreams. 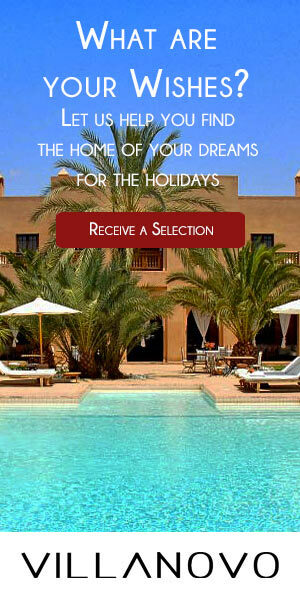 After discovering our wide selection of luxury in Marrakech, how to choose THE house of your dream vacation? At Villanovo, our reservation and organisation service is at your disposal from the moment you contact us. For us, a personalised service starts as soon as you look for a villa. Thus, our experts get in touch with you, and, based on your selection criteria, go in search of your dream villa. Customised coaching is about getting to know you, becoming familiar with your preferences, your budget, your expectations and concerns. A large house for a large family, or an intimate villa for a couple stay? A large garden for pets and energetic children? 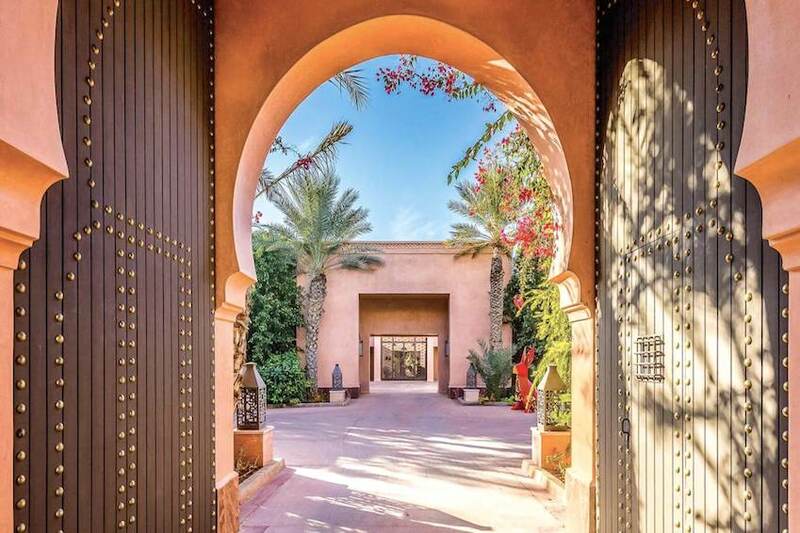 Located in the palm grove of Marrakech, or on the Amelkis golf course? You will understand, nothing passes the trap of our villa hunters! If for you "tranquility" rhymes above all with "organisation", do not worry, we take care of everything! Our concierge service helps you plan, once again according to your wishes and constraints, your program once there. From your arrival, to a transfer by taxi, minibus, limousine, or rental of a vehicle, passing by your reception on the spot, until the program of your stay, we do not neglect any detail. As you can discover in our "Interview of Bettina, concierge in Marrakech: behind the scenes of a tailor-made service", our concierge service is based on a local team, who are experts of Marrakech. They will be happy to concoct a guide and plan activities composed of the best locations of the big city. 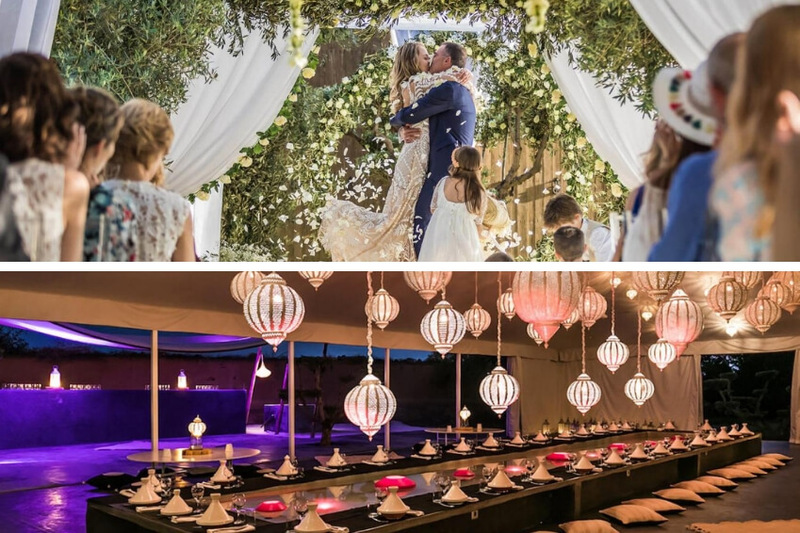 Do you want to use a luxury villa in Marrakech to organise your big event? Everything is under control! Anniversary, weddings, photo shoots, all our events are held outdoors under ancient olive trees, in enchanting reception areas under the African sun. Our team will strive to learn about your tastes and desires to create the party of your dreams: themed celebrations, specific requirements or unusual queries, nothing scares our event planners team who work closely with the best providers, discreetly. Your luxury villa is found, your stay is organised and planned closely by our concierge service, the holidays can begin! It's time to relax, and refocus on your well-being...Meet your house staff! Qualified, dedicated, and local, this personalised service guarantees you complete support, removing all your concerns. Do not worry about meals, just sit around a table on one of the comfortable terraces or dining rooms to share a delicious local meal with your loved ones. Our cooks are attentive to your desires and preferences to concoct the best of their dishes. According to your request, the rest of the house staff will ensure the proper functioning of the house: replenishment, maintenance of the garden, pool, and other equipment, everything will be done to ensure a stay within an orderly and lush environment. Do you want to rent a house with a spa? Enjoy even more personalised services such as a massage session by one of our professionals. Also, be aware that our concierges are at your disposal throughout your stay. Do not hesitate to communicate to them your least question or concern: looking for a babysitter, booking a restaurant or excursion, special request, need a vehicle...We accompany you throughout your stay. Your journey is coming to an end, but our personalised service is always a must! Thus, under request, our team will organise your transfer from your villa to the airport of Marrakech, for a return in complete relaxation. Because we aspire to provide you with an exclusive, peaceful, and trouble-free experience, your opinion about your stay matters. To continue this relationship of trust and listening that we particularly love, we invite you to share your opinion about your experience.